Originally published under the title, "Turkey's Illusions Hit Realities." Hundreds of Turkish troops entered Syria on the night of February 21 to evacuate 38 Turkish guards at the tomb of Suleyman Shah, the grandfather of the Ottoman Empire's founder. Turkey's dramatic miscalculation over Syria is pushing it into weird acts. The latest was the forced relocation of a pre-Ottoman Turkish commander's tomb from its spot in Syria to another spot in Syria, this time a stone's throw away from the Turkish border. Relocating the tomb seems to have been prompted by the fear of an attack from radical Islamists -- who, ironically, Turkey wanted discreetly to support. Prime Minister Ahmet Davutoglu, who in 2001 authored the 600-page book, "Strategic Depth," hoped at the start of the Arab Spring, when he served as Foreign Minister, that a belt of (Sunni) Muslim Brotherhood-ruled regimes would proliferate in Syria, Egypt, Tunisia, Lebanon and Libya, and be subservient to an emerging Turkish empire. To start with Syria, therefore, the Nusayri strongman of the country, President Bashar al-Assad, had to go. In August 2012, Davutoglu predicted that Assad's days in power were numbered "to a few weeks." Turkey once hoped to see a belt of (Sunni) Muslim Brotherhood-ruled regimes in Syria, Egypt, Tunisia, Lebanon and Libya. Two and a half years later, Assad is no longer Turkey's southern neighbor. Instead, various groups of jihadists and armed comrades from among Turkey's own restive Kurds are Turkey's new neighbors across the 910 km border. It was one of those violent groups, the Islamic State of Iraq and Syria [ISIS, aka The Islamic State], which prompted Turkey to perform one of the most bizarre military operations in recent history. Suleyman Shah was the grandfather of Osman I, the founder of the Ottoman Empire and a revered figure for the Turks. He is believed to have drowned in the Euphrates in 1236, and was buried in what is now Syria. In 1886, a tomb was built for him. And in 1921, when France controlled Syria, it signed a peace treaty with Turkey and granted the Turks sovereignty over the small plot of land that hosted Suleyman Shah's tomb. That land would be Turkey's only sovereign land outside its own territory. The tomb of Suleyman Shah, the grandfather of the Sultan Osman, founder of the Ottoman dynasty (the tomb known under the name of Turk Mezari), situated at Jaber-Kalesi shall remain, with its appurtenances, the property of Turkey, which may appoint guardians for it and may hoist the Turkish flag there. 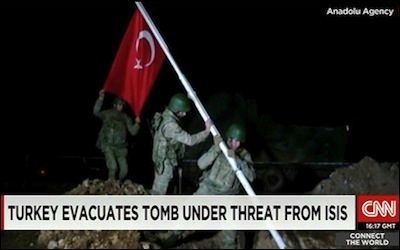 Although the tomb was relocated to a new piece of land inside Syria in 1973, due to threats from floods from a dam, its new location also became a de facto Turkish enclave. A garrison of 38 Turkish soldiers has stood guard permanently at the tomb since then. The guards were regularly replaced with new conscripts until eight months ago when, threatened by ISIS, the Turkish military felt no longer able to change them: The guards were besieged at the tomb, surrounded by ISIS's jihadists who have a notoriety for destroying tombs and sepulchers that they deem "un-Islamic." On the night of Feb. 21, the Turkish military sent 572 troops, 39 tanks, 57 armored vehicles and 100 other vehicles to extract its soldiers from there. The building was destroyed by the army (in order not to let ISIS do that); the tomb was transferred to land just a few hundred meters away from the Turkish border, and the risk of humiliation from a new encounter with ISIS was averted. (In 2014, ISIS raided the Turkish consulate in Mosul, Iraq's second biggest city, and held hostage 46 people, including the consul general, consul staff and their family members. The hostages were released after 101 days of captivity under terms that were never disclosed). The tomb rescue operation, at best, could be considered a retreat with a rational explanation. Apparently, the Turkish government does not want to confront ISIS, which until recently was its comrade-in-arms against Assad. The risk of another hostage crisis with ISIS would have been too embarrassing for Turkey's government, especially with only about 100 days to go until critical parliamentary elections. But instead of taking modest pride in successfully averting a crisis, the Turkish leadership and its cheerleaders in the media -- 65% of which it controls -- portrayed the operation as if Turkish special forces had abducted Assad, rather than rescuing their own besieged soldiers and the roaming tomb of a pre-Ottoman Turkish commander. One headline said, "The world is talking about the success of Operation Suleyman Shah." Other headlines said: "The Turkomans are proud"; "No permission, we just went there and took it"; "We hit whoever stood on our way"; "The epic [tale] of Shah Euphrates." Social media were quickly filled with jokes teasing the "heroes." 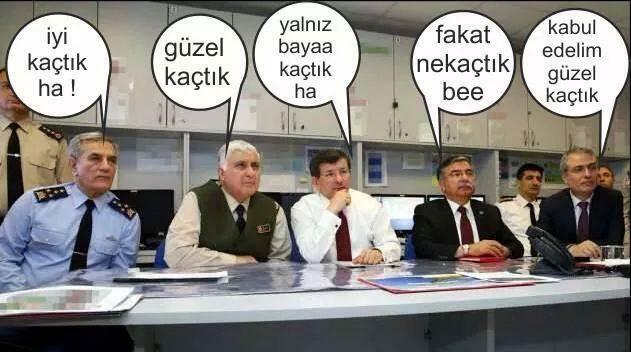 One of them created speech balloons on a photo that shows Davutoglu and the top military brass managing the crisis at military headquarters. The speech balloons say "What an escape it was! "; "How successfully we ran away, eh? "; "After all, it was a perfect escape"; and "Let's accept it... We ran away so skillfully..."
Another photo shows Davutoglu with General Necdet Ozel, Turkey's top military commander. Ozel's speech balloon reads: "Now are we abandoning the tomb?" To which Davutoglu answers: "Do you think we should also abandon Hatay (a Turkish city claimed by Syria)?" Meanwhile, the air force commander looks on and says: "Strategic madness..."
In many ways, the "abduction from the tomb" is not just neo-Ottoman skullduggery. It is yet another face of neo-Ottoman illusions hitting hard on a wall of Middle Eastern realities.